The Nigerian people, upbeat and enthusiastic, seemed to relish the chance to watch shows rotating on the runway, or the opportunity to view an exhibition of bold purses. Woven, feathered and beaded by skillful fingers, these carefully crafted accessories gave a whole new meaning to “hand” bag. In an international fashion world where a blasé boredom often engulfs the audience, the Lagos Fashion & Design Week was a tonic. First came the fabrics: patterns put together with the crazy intricacy seen on the streets, but in a controlled and convincing way. A narrative print of stick figures, as if from some local event, walked the vivid yellow surface of a Tiffany Amber jumpsuit. At Jewel by Lisa , the cup-shaped boats surfing the undulating silk fabric had a message: the life of the ancient Hausa-Fulani people. “I did a lot of research — and I always want to bring it home. It is about what we are about,” said Lisa Folawiyo, the designer behind the label. The slender silhouettes and wax print patterns in strong colors from Jewel by Lisa will be one of several brands on sale next month in a pop-up boutique inside the London store Selfridges. Love-to-shop Nigerians figure at No.5 among the store’s big-spending Chinese, Middle Eastern and Russian clients. Judd Crane, Selfridges’ director of women’s wear, says: “We are delighted to launch this special showcase featuring some of the best fashion from Nigeria. We have been taking note of the development of the fashion scene over there for a the past couple of years and been thinking of bringing them to London for a while. It felt right this year to demonstrate the power and originality from Africa. Behind the Lagos Fashion & Design initiative, now in its second season, is its organizer: Omoyemi Akerele, trained as a lawyer, but now administrator and organizer of fashion brand-building. Determined to push forward the disparate talents in her native country, she has sought the support of Abimbola Fashola, first lady of Lagos State in Nigerian, as well as finding sponsorship to present its fashion to the world. “People here are hungry for knowledge about fashion and other creative industries — but how do we learn more and gain access?” says Ms. Akerele, who feels that she has only begun to put things in place. The summer 2013 collections were vibrant in color, joyous in spirit and shown on curvy models to mirror the glamorous figures in the front row. If there were some echoes from the international collections — Riccardo Tisci’s mouthpieces, Mary Katrantzou’s postage stamp patterns and John Galliano’s newspaper print, the shows still seemed inventive. The pan-African fashion magazine “Arise” has been promoting the continent’s designers since its debut in 2009, organizing events during New York fashion weeks, in Paris, Johannesburg and its own fashion weeks in Lagos, most recently showing the work of 77 designers over four days in March. Ms. Akerele also means business. This year she took a handful of local designers to show at the Pitti Immagine women’s event in Florence; and again to a talent contest in Milan put forward by Italian Vogue. 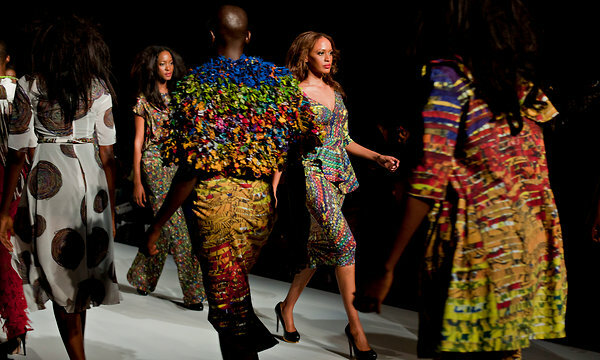 Scheduling the Lagos catwalk shows back-to-back was slightly frustrating. It seemed like the same models were in a loop, running through the convention center of the Eko Hotel. But the relative calm of the shows’ pace offered a kind of parallel world to the madness of the oil-rich, construction-crazy city of Lagos, with its high-rise buildings and traffic chaos in streets cleansed by a new sweeping initiative. The swagger of the Lagos man was captured by the jaunty tailoring of Emmy Collins or the mix of Madras checks from Kola Kuddus . On a quieter note, the Sudanese designer Omer Asim expressed in long, light fabrics, shown on barefoot models, a graceful spirit. Getting the right dose of urban and tribal is the skill of Anita Quansah , a Nigerian-born designer living in England. Her striking pieces of jewelry might better be described as totems: rings of beads or feathers worn on the head or around the neck. “I like to do something experimental and a work of art, taking jewelry to the next level,” said Ms. Quansah. She says she feels that Lagos needs what England has: fashion colleges as an education and a platform. Ms. Akerele is working to open next year a Modern Day School of the Arts, which will offer courses in fashion, photography, Web design and multimedia platforms. That kind of education might help designers to dig deeper, like using as inspiration the spiders’ webs of electric wires spun across the city or the remnants of Portuguese colonial architecture rather than more predictable ideas taken from nature — although fragile butterfly wings were used in broken patterns to great effect by Lanre Da Silva-Ajayi for her LDA label. But it is left to creative and artistic designers like Amaka Osakwe, behind the Maki Oh label, to revitalize dying skills. She found a Nigerian woman believed to be the last person using the traditional handwork process of making adire, a fabric with an indigo-dye pattern. The designer reinvented the method, using silk instead of cotton, to create her own prints that she then mixed with silken fringing. “I wanted to create secrets,” said Ms. Osakwe, referring to her collection’s spirit, but also suggesting the fabric technique was infused with ancient spirit and meaning. Ms. Akerele understands that fashion does not stop when the catwalk is dismantled. She invited Matthew Williamson, celebrating 15 years in business in London, to show his sophisticated collection, giving the local designers an opportunity to see how to raise the level of their own work. “In five or seven years, I envisage an industry functioning in a more organized manner, starting from a situation where designers have more access to textiles, more schools and training,” Ms. Akerele said. In a way, because Lagos has not yet been invaded by the well-known luxury brands, this is a honeymoon period for local designers who have married technique and craft and find a hunger for their products. Ms. Akerele wants to push forward a campaign to “buy Nigerian” and “eventually to reposition and re-engineer the minds of Nigerian people” to encourage them to pick emerging or established local designers. On the political side, Mrs. Fashola talks of a pan-Nigeria textile project to train seamstresses. But, judging by the number of Nigerian travelers arriving at the airport laden with branded carrier bags, shopping abroad is a favorite pastime. As the final shows ended to cheers and applause, Ms. Akerele knew her follow-up work was just beginning. She sums up her aims for Lagos fashion and design as, first, to find aid for designers to develop their skills; then, to turn their focus beyond the runway to the commercial world; and, finally, always to keep that nugget of “Nigerian” that makes the work of these designers so special.